THE POTENTIOMETER AND THE RHEOSTAT are variable resistors and can be adjusted to any resistance value within their ohmic range. The rheostat is usually used for relatively high current applications and has two connections; the potentiometer has 3 connections and is a relatively high- resistance, low-current device. RELIABILITY LEVEL PER 1,000 HRS. The WATTAGE RATING of a RESISTOR is related to the resistor's physical size, that is, the greater the surface area exposed to the air, the larger the rating. ANSWERS TO QUESTIONS Q1 THROUGH Q65. A1. Anything that occupies space and has weight. Solids, liquids, gases. A2. A substance which cannot be reduced to a simpler substance by chemical means. A3. A substance consisting two or more elements. A4. A compound is a chemical combination elements that cannot be separated by physical means. A mixture is a physical combination elements and compounds that are not chemically combined. A5. A chemical combination two or more atoms. A6. Electrons-negative, protons-positive, and neutrons-neutral. A8. Invisible light photons (ultraviolet) bombard the phosphor atom in the light tube. The phosphor atoms emit visible light photons. A9. The number electrons in the outer shell. A10. An atom with more or less than its normal number electrons. A11. The number valence electrons. A12. Through the accumulation excess electrons. A15. Like charges repel, and unlike charges attract with a force directly proportional to the product their charges and inversely proportional to the square the distance between them. A16. The space between and around charged bodies. A17. Leaving positive, entering negative. A18. Motors, generators, speakers, computers, televisions, tape recorders, and many others. A19. Those materials that are attracted by magnets and have the ability to become magnetized. A20. The relative ease with which they are magnetized. A21. A material that exhibits low reluctance and high permeability, such as iron or soft steel. A22. The ability a material to retain magnetism. A23. They are very similar; like charges repel, unlike charges attract, like poles repel - unlike poles attract. A24. To the magnetic north pole. A25. South pole at the right, north pole at the left. A26. The domain theory is based upon the electron spin principle; Weber's theory uses the concept tiny molecular magnets. A27. To enable you to "see" the magnetic field. A28. No specific pattern, sawdust is a nonmagnetic material. A29. An imaginary line used to illustrate magnetic effects. A30. Electrostatic lines force do not form closed loops. A31. By shielding or surrounding the instrument with a cast iron case, called a magnetic shield or screen. A32. In pairs, with opposite poles together to provide a complete path for magnetic flux. A33. The ability to do work. A40. Friction, pressure, heat, light, chemical action, and magnetism. A45. Electron theory assumes that electron flow is from negative to positive. A46. The speed light (186,000 miles per second, 300,000,000 meters per second). A47. Current increases as voltage increases. A50. When the need for conductivity is great enough to justify the additional expense. A54. The mho (inverted ohm symbol), siemens. A55. They are reciprocals each other. A57. Its ability to dissipate heat. A58. 1. Change value with age. 2. Limited power capacity. A60. 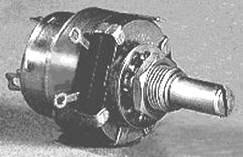 The rheostat may have two connections, one fixed and one moveable; the potentiometer always has three connections, one moveable and two fixed. A62. The bands are green, black, black, and gold. A63. 470,000 ohms (470 kilohms). A64. The resistor's chance failure is 0.001 percent for 1000 hours operation. A65. 6,800,000 ohms (6.8 megohms), with 5% tolerance, and a 1% reliability level.